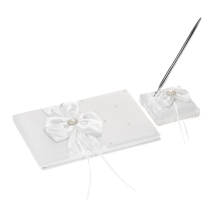 This guest book and pen set is a beautiful keepsake of your special day! Smooth silk satin face with rhinestones and faux pearls dotted and big bowknot decorated, beautiful and elegant. Guest signature book + black ball-point pen + pen stand. Smooth silk satin face, rhinestones and faux pearls dotted, and bowknot decorated. 72 pages high quality paper and exquisite ball-point pen. 1 page for wedding address, bride and groom name. 1 page for bride&apos;s family. 1 page for groom&apos; s family. 1 page for maid of honor, bridesmaids and flower girl. 1 page for best man, groomsmen and ring bearer.